Bordentown, NJ - September 16, 2008 - Viking is pleased to announce that it has been named Official Ball of all American Platform Tennis Association (APTA) National Championships through 2013. 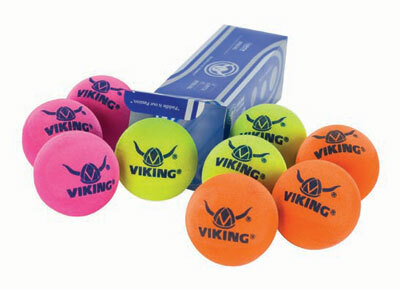 While the Viking ball has been used at the Men’s and Women’s Open APTA National Championships since 1999, this decision, effective immediately, solidifies the APTA’s preference to use Viking products for the sport’s biggest events. Viking officially became a member of racquet sports leader Prince Sports, Inc in March 2008 and since that time has utilized the parent company’s vast resources, research capabilities and production management to further perfect a host of platform tennis products. Since the new partnership, Prince got right to work on upgrading the quality control procedures on the Viking ball and the marketing team designed new eye-catching packaging for enhanced shelf appeal at retail. The Viking ball has also already been selected for use at the 2008 Chicago Charities and the 2008 Sound Shore Invitational - two major events on the tournament schedule. “Viking has been the number one ball since 1999 and we take pride in knowing that players as well as the APTA recognize our dedication and devotion to the sport of platform tennis,” states David Kjeldsen founder of Viking Athletics. Viking Athletics, Ltd. has been an equipment leader in the sport of platform tennis since the company was founded in 1995. Viking offers the most complete line of high performance and game improvement platform tennis paddles, balls, bags, apparel and accessories including the OZ TM, the sport’s best selling paddle for twelve consecutive years. Viking is the Official Ball of all APTA National events and enjoys a significant ball market share position with a majority of all balls sold in the sport during 2007. Currently over 70% of the top men and 60% of the top women players in the world use Viking paddles. * Viking is also the unquestioned grass roots leader of the sport sponsoring the Viking Academy instructional clinics and the Viking Junior Tour dedicated to growing the sport through youth development programs. For more information, please visit www.vikingathletics.com, www.vikingjuniortour.com, www.vikingacademy.com. Viking Athletics is part of the Prince Sports, Inc. group of companies.